See also : Nigel Farage colonizes Australia, Zoya Sheftalovich, politico, September 6, 2018 | Deplorables love in for Tony Abbott and Nigel Farage, Aaron Patrick, Australian Financial Review, September 7, 2018. 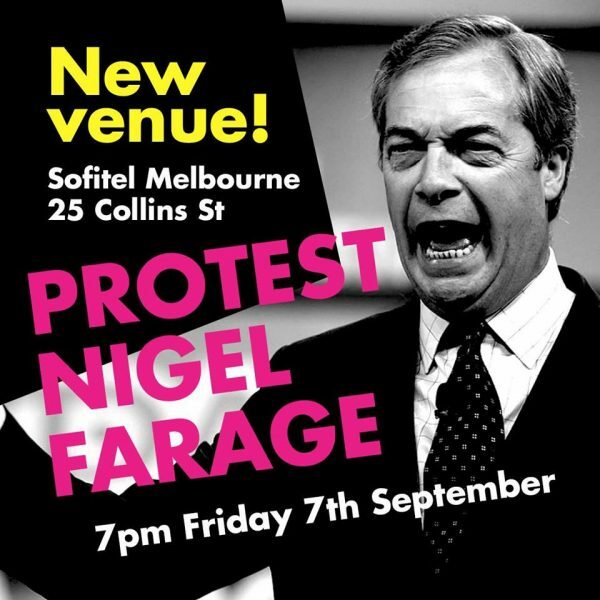 The final leg of Nigel Farage’s blitzkrieg tour Down under takes place at the Sofitel Hotel (25 Collins Street) later today. The Campaign Against Racism & Fascism (CARF) has organised a protest outside the venue. For more details and to keep up-to-date with what’s up, see the Facebook event page here. 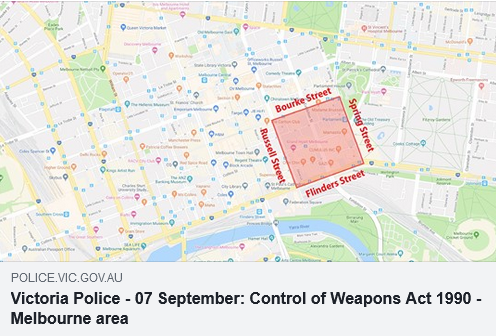 Victoria Police have declared the blocks surrounding the venue a designated area, granting them various additional powers. To this point, ticket sales appear to be somewhat disappointing for organisers, with the original Sydney venue (September 6), the International Convention Centre (which previously played happy hosts to some barking-mad anti-Aboriginal hate-speech courtesy of Stefan Molyneux and Lauren Southern) being pulled and the event taking place at Doltone House instead. This parallels the experience in Adelaide — where it was marketed as being at the Town Hall but with attendees being directed to a smaller venue a short distance away — and so too Perth. … the party has suddenly come to a spectacular halt and the “bromance” is over amid wild accusations on both sides and a trail of debt, with Mr Markson claiming Mr Costas owes him $90,000. Mr Markson and Mr Costas are also at war over hundreds of thousands of dollars in unpaid bills from the tour, with money owed to everyone from venue operators to security guards, Yiannopoulos and the family of one of Australia’s biggest drug smugglers. Mr Costas confirmed Yiannopoulos was still owed money from the tour, but he wasn’t the one owing it. Mr Markson said Yiannopoulos, who agreed to do the tour in return for a $250,000 fee, was still owed several thousand dollars, but denied he was responsible. See : Private Sydney: Markson sparks up in court in dispute with Penthouse publisher, Andrew Hornery, The Sydney Morning Herald, September 6, 2018. See also : Poor ticket sales force Nigel Farage to move Australian gig to smaller venue, Jonathon Read, The New European, September 6, 2018. Maybe 200 or so folks staged a rally outside the Sofitel; a handful were arrested. Cooked Convict Neil Erikson was detained by police, Rino ‘Bluebeard’ Grgurovic lost his MAGA hat, and their mate Andy Nolch (see : Anti-feminist charged over Eurydice Dixon graffiti has ‘no remorse’, court hears, Tammy Mills & Sarah Emery, The Age, September 8, 2018) was also there to be entertained by Farage. See : Nigel Farage: Clashes break out at former UKIP leader’s Melbourne event, Joshua McDonald, ABC, September 8, 2018 | Arrests after hundreds rallied against right-wing Nigel Farage in Melbourne’s CBD, The New Daily/AAP, September 8, 2018. This entry was posted in Anti-fascism, State / Politics, That's Capitalism! and tagged 25 Collins Street Melbourne, Andrew Nolch, Andy Nolch, Campaign Against Racism and Fascism, Cooked Convicts, Cooks Convicts, Damien Costas, Doltone House, ICC Sydney, International Convention Centre, Max Markson, Neil Erikson, Nigel Farage, Rino 'Bluebeard' Grgurovic, Rino Grgurovic, Sofitel Hotel. Bookmark the permalink. The left misbehaving again just proves that their ideologues do not believe in democracy or freedom of speech. Farage is a cuckservative who supports immigration. He even had a go at Pauline over her comments on Muslim immigration so what were the idiots protesting about? For attention: Messrs. Nick Folkes, Blair Cottrell and many other young fools who delusionally believe themselves to be ‘qualified’ to be interfering in matters relating to our national well-being. I am a conservative – a word of which you self-evidently have zero understanding. People like yourselves – basically no different from those on the opposite side of the ideological fence who promote anarchy and the destruction of Australia – are not conservatives. Nor are you beneficial or advantageous to Australia, which is something else you have in common with leftists. People like you give genuine, informed, intelligent and mature conservatives a bad name. You foolishly provide ammunition to leftists for use as ‘evidence’ to support their argument that ‘all’ conservatives are ‘extremist right-wing fools’. Leftists are, of course, too immoral to ever admit that their view of ‘all’ conservatives is at least dishonest if not a self-serving lie. But people like you are basically no better, so point not any finger at them. Notwithstanding that you clearly believe you can ‘make a difference,’ your ignorance, inexperience and lack of intelligence – not to mention your arrogance and out-of-control, testosteroned ego – serve only to harm and debilitate the efforts of intelligent, properly experienced people who diligently and intelligently work to stop the self-destruction of Australia. Is there any chance that you could just shut up, go away and find something fairly simple to do that would suit your (lack of) knowledge, (lack of) experience and (total lack of) intelligence? Street-sweeping, lawn-mowing, or some form of manual labour requiring little intelligence come to mind; but that would be an insult to many good people doing that kind of work, which, in any event, you obviously believe yourselves too ‘important’ to be doing. Oh well, I suppose there’s always the dole – if that would serve to shut you up and make you just go away and stop, in your utter and abject ignorance, facilitating the destruction of all that was good about Australia. I am not a fascist. Therefore I would not attempt to command that you do not respond to this message. However, be aware that, given that there is nothing of value that you could offer me, I have the right to – and will – ignore anything you might brainlessly attempt to direct at me.